This card arrived in the mail today, and with it I am now just one card away from reassembling my 1953 Bowman Color team set. I actually had a complete team set roughly 10 years ago, but I had to sell off most of it (as well as the bulk of many other teams sets of similar or older vintage) for financial reasons. For a few years, I tried to make myself content with a reprint set. However, the reprints for this set were particularly unappealing to me. It wasn’t the quality of the reprints (they were nicely done), but the fact that I particularly loved the 1953 Bowman Color set that made the reprints feel like a stop-gap measure. 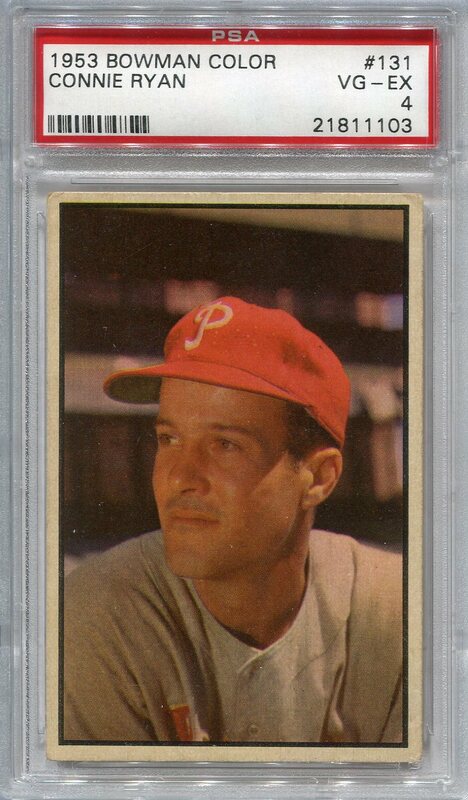 So, once the financial situation improved again, recollecting these sets became a goal, and with the arrival of this card, Karl Drews becomes the last card I need to once again have all the Phillies from this iconic set. At this point, I have managed to recollect a few of the vintage team sets I had to rip apart, and a few others are also just a card way from completion. It will feel particularly good, though, once I have the ’53 Bowman Color Drews in my collection once again. Additional Information: Set was reprinted in its entirety in the 1991 Topps Archives 1953 set. Topps reused the design first in the 1999 Topps Gallery Heritage insert set and then more notably in its 2002 Topps Heritage offering. 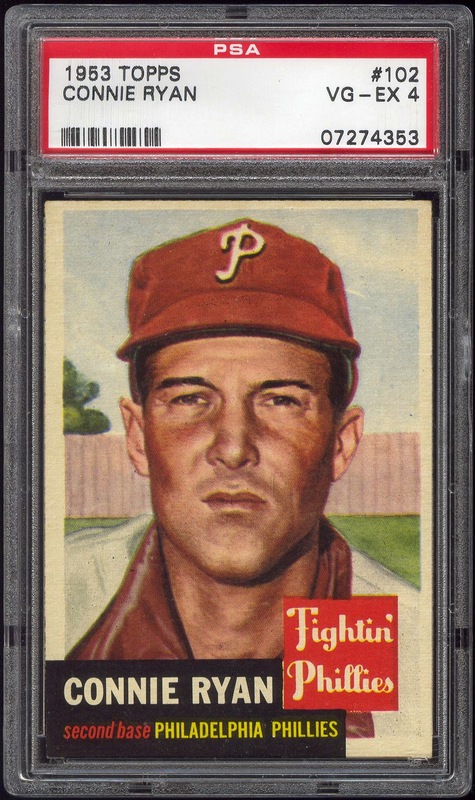 The relatively small size of the set, as well as the notable absence of many of the Phillies stars of the time, resulted entirely from Topps’s ongoing legal battles with Bowman, who had secured exclusive baseball card contracts with many Major League players. Topps eventually sold the artwork for the planned Richie Ashburn card, and Bob Lemke, former editor of the Standard Catalog of Baseball Cards, used it to create a mock-up of what the card might have looked like. 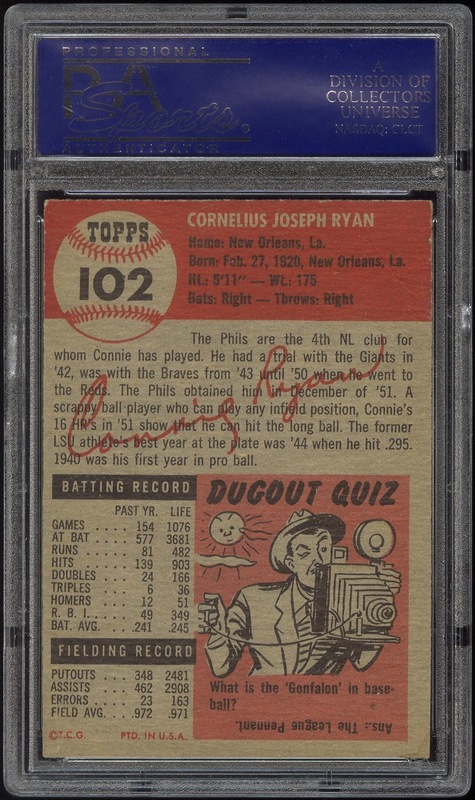 14,000 Phillies Commentary: Almost certainly the easiest and least-costly of the early Topps sets for Phillies team collectors to complete. Personally, I am happy with owning the 1991 Topps Archives 1953 reprint of the set, which includes a rather poorly executed “Cards That Never Were” subset that contains cards for Ashburn, Curt Simmons, Robin Roberts and manager Steve O’Neill. However, when the mood struck I have cheaply acquired a couple graded ’53 cards. The Phillies Room has a nice write-up on the set.